Fittings that Came with my Water Filter? We call them “plug-in elbows,” and we include one or two with every undersink filter or reverse osmosis unit that we sell. Their purpose is to allow you to make an elbow out of a straight Quick Connect fitting. 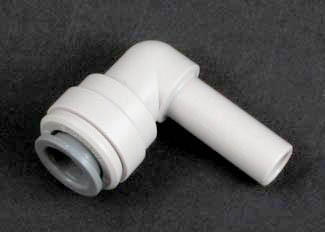 For example, if your unit is sitting under the faucet you are connecting to, rather than plug the tube directly into the outlet fitting on the unit at an awkward angle, you can plug the elbow into the fitting, then plug your tube into the elbow. It makes a connection that's easy to install, almost never leaks, and, best of all, will swivel and adjust itself if you move the unit. As with all John Guest fittings, you can release the tubing by pushing in on the collet (the dark part of the fitting in the picture) and pulling out the tubing. If you don't need an elbow, just connect your tubing directly into the fitting and save the plug-in for a future use.